UPDATE: 09/26 Calandra has given an Oscar level apology in which he states he will almost certainly repeat his behavior .. But he is sorry. See bottom for full text of that apology as well as video. Noticeably absent from his apology … is Canadians! He apologizes to The House, The Opposition and his fellow Party Members. Canadians have never been very enthusiastic about politics. But the Conservative Party has taken Canada to embarrassing new lows and the world is taking notice. Multiple publications from The CBC, Macleans, The Ottawa Citizen, The Huffington Post, Canada.com, and many more have stood up and pointed out this latest blatant disregard for Democracy and candid Contempt of Parliament at the hands of the Conservative Party. 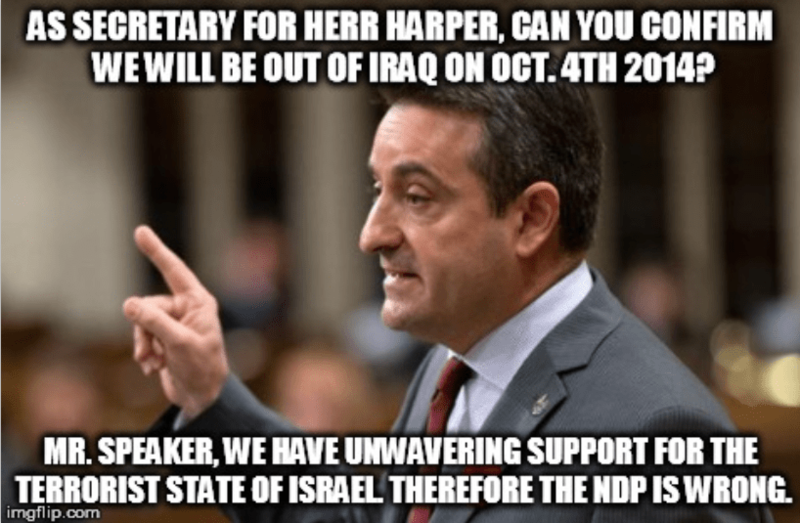 Specifically the Parliamentary Secretary for the Prime Minister, Paul Calandra. The last time the Conservatives were found in Contempt of Parliament was in 2011. The House of Commons enjoys very wide latitude in maintaining its dignity and authority through the exercise of its contempt power. In other words, the House may consider any misconduct to be contempt and may deal with it accordingly. Instances of contempt in one Parliament may even be punished by another Parliament. This area of parliamentary law is therefore extremely fluid and most valuable for the Commons to be able to meet novel situations. Throughout the Commonwealth most procedural authorities hold that contempts, as opposed to “privileges”, cannot be enumerated or categorized. Speaker Sauvé explained in a 1980 ruling: “… while our privileges are defined, contempt of the House has no limits. When new ways are found to interfere with our proceedings, so too will the House, in appropriate cases, be able to find that a contempt of the House has occurred”. * divulging or publishing the content of any report or evidence of a select committee before it has been reported to the House. * failing to fulfil any requirement of the House, as declared in a code of conduct or otherwise, relating to the possession, declaration, or registration of financial interests or participation in debate or other proceedings. Just as it is not possible to categorize or to delineate every incident which may fall under the definition of contempt, it is also difficult to categorize the “severity” of contempt. Contempts may vary greatly in their gravity; matters ranging from minor breaches of decorum to grave attacks against the authority of Parliament may be considered as contempts. You can watch the actual exchange here. “to consider how the House can improve things so that observers can at least agree that question period presents an exchange of views and provides at least some information. Essentially .. the Conservatives could answer serious questions about their criminality or what exactly in the hell they are doing to Canada by reciting Harry Potter or invoking the Bible — And the democratic process in Canada is just utterly powerless to stop it? Really!? Which has many Canadians wondering, If absurd exchanges like this are within the rules of the House of Commons. Then, Perhaps it is time to change those rules. Indeed the NDP has proposed a motion to do exactly that. How are Canadians supposed to participate in an informed democracy when you’ve got a party like the Conservatives in power that essentially provide you with nothing but talking points from attack ads on their opposition and no information whatsoever on what they are doing to Canada or why. “Question Period needs answers too. Add your name to back our plan to fix QP. Day after day, Tom Mulcair puts serious questions to the Conservatives in Parliament, on the issues that matter to you. But instead of serious answers, we keep hearing talking points, platitudes and partisan attacks. On September 26, Stephen Harper’s lead spokesperson offered a tearful apology in the House—after his outrageous non-answers on Iraq sparked national outrage. That Standing Order 11(2) be replaced with the following: The Speaker or the Chair of Committees of the Whole, after having called the attention of the House, or of the Committee, to the conduct of a Member who persists in irrelevance, or repetition, including during responses to oral questions, may direct the Member to discontinue his or her intervention, and if then the Member still continues to speak, the Speaker shall name the Member or, if in Committee of the Whole, the Chair shall report the Member to the House. ← John Oliver did a segment on Drones everyone needs to see.